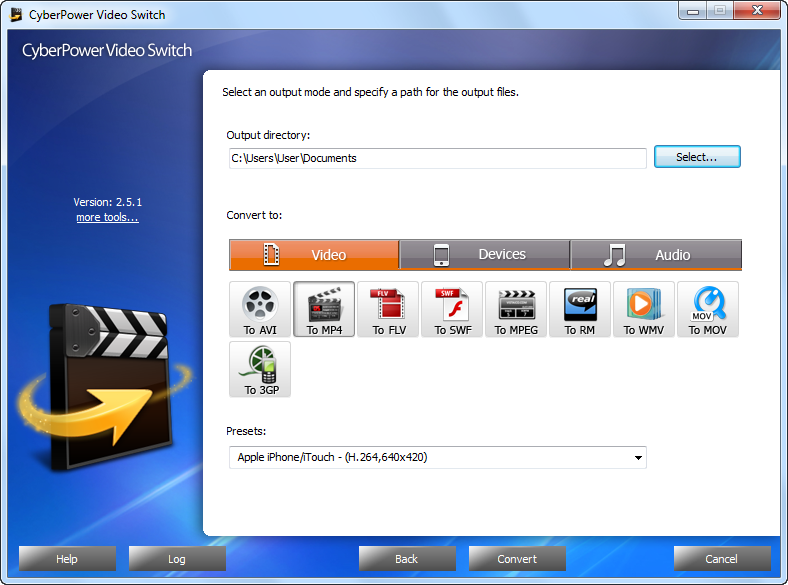 CyberPower Video Switch is a piece of extremely powerful and full-featured video converter that can convert videos among different formats like MPEG, WMV, AVI, MP4, FLV, 3GP, MOV and many others with high speed and excellent quality. By taking advantage of this easy video format converter, you can enjoy your favorite videos and music freely on any portable player like iPhone, iPod, iPad, Apple TV, PSP, etc. Qweas is providing links to CyberPower Video Switch 8.2.3 as a courtesy, and makes no representations regarding CyberPower Video Switch or any other applications or any information related thereto. Any questions, complaints or claims regarding this application CyberPower Video Switch 8.2.3 must be directed to the appropriate software vendor. You may click the publisher link of CyberPower Video Switch on the top of this page to get more details about the vendor.